Our mission is to provide our tenants with the cleanest, most secure storage facility while accommodating every customer's moving and storage needs through effective management of a highly motivated and well trained staff. 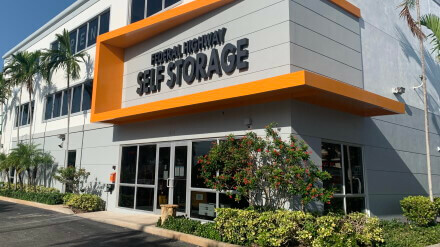 Federal Highway Self Storage is a premier Self Storage operator in Deerfield Beach, Florida. Federal Highway Self Storage is a State-Of-The-Art Self Storage facility. Federal Highway Self Storage offers Self Storage units of all sizes with attractive features such as climate control, RV parking spaces, individual door alarms, gated entry, and month-to-month leases. A full line of boxes and packing supplies is also available at each one of our location. Typical office hours are 9:00 AM until 6:00 PM with our friendly and professional staff ready to help you! With available units and amazing move-in specials, let Federal Highway Self Storage be your home for all of your Self Storage needs! Stop by today!